We've spent the last week on a family/neighbor vacation in Hawaii. Leaving Portland in the winter is a good strategy, except that 12 of the 14 days before we departed had the best weather you could expect during a Portland winter -- sunny and not too cold. It was still a good time; also a first for me, I'd never been to Hawaii. Kona Brewing Fire Rock Pale Ale: quite tasty on tap; surprisingly dull in bottles. Maui Brewing Big Swell IPA: nice hoppy IPA in a can. Hawai'i Nui Golden Ale: sounds like a beer aimed at novices, but it has a nice, balanced flavor. Waimea Brewing (no website?) Uli Uli Brown: mild caramelly session beer at the island's only brewpub. Mehana Brewing Mauna Kea Pale Ale: pretty good pale; hop flavor reminded me of Hopworks IPA. Kona Brewing Pipeline Porter: nice coffee porter. Maui Brewing Coconut Porter: pleasant, but a little syrupy. Waimea says it's the westernmost brewpub in the world, which only means there are no brewpubs in Nome or American Samoa. It was a pleasant place to have a couple of beers with lunch; you could compare it to the Lucky Lab in terms of quality and atmosphere -- laid-back, comfortable place, beers drinkable but not earth-shattering. The brown ale seemed the best, but the red ale and porter were good also. I couldn't resist polluting my Beer Mapping Project Twitter map with my visit to Waimea, but it messes up the map so badly that I'll have to delete that tweet pretty soon. I found it interesting that the locals could really care less about Hawaiian beer. 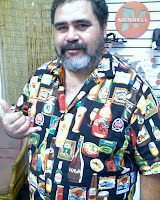 This picture is of a guy whose aloha shirt had an excellent pattern with dozens of old-time Hawaiian beer labels and bottles. When asked what kind of local beer he liked, the only two he could think of were Primo -- a lager now contract-brewed in California -- and Steinlager, which of course is from New Zealand. Another guy standing in line behind me at Safeway pointed at the local beers I was buying and asked "Are any of those any good?". I gave him a few brief reviews, and he said, a little sheepishly, "I've never tried any Hawaiian beer, I always just get the other stuff." It's been a great vacation, but it will be nice to get back to Beervana! Ahhhh...still had a few bottles of Brown Shugga in the fridge; a nice way to welcome myself home. Now I have to hunt down some Black Gold. On the other hand, the money you can make selling beer to tourists must be much more than you can make selling to Hawaiians, so there's no great incentive for a Hawaii brewery to try and attract local fans.